If you're looking to escape the cold, head to Cabo for some golfing. Where should you golf? Read on to learn about the best golf courses in Cabo. Cabo is a favorite travel destination for golfers. We've seen travel to Cabo rise to the highest rates in nearly a decade. This may be because of its ease of access and luxury accommodations. Or maybe golfers come to enjoy the climate and beautiful landscapes. See what you've been missing. Check out the best golf courses in Cabo to start planning your trip. When you are on a golf vacation, you want to be golfing, not driving (in the car that is!). This course is in an ideal location, just a 10-minute drive from the historic city of San Jose Del Cabo. And the views will take your breath away! The Marina nine hole course is surrounded by rolling hills and expansive ocean views. You’ll enjoy a beautiful desert landscape with distant mountains on the Mission nine hole course. According to the Puerto Los Cabos website, the Sea of Cortez is visible from 70% of the course. Talk about stunning! As if all of that wasn’t enough to get you packing, plans are currently in the works for another nine-hole course at Puerto Los Cabos. At Palmilla you can play your choice of nine holes from the 27 available. Palmilla boasts the first Jack Nicklaus Signature design in Latin America. The best part of destination golf is amazing views. A favorite at Palmilla is the Ocean Course. You won’t get tired of these views! In the first six holes alone, the elevation changes 600 feet. You can also golf with the canyon backdrop of the Arroyo Course, or the steep rocky views of the Mountain Course. On the Mountain Course you'll be lead uphill at hole 3 to overlook the beautiful water reservoir at holes 4 and 5. This is the only course in Cabo to host two different PGA Senior Grand Slam events, in 1996 and 1999. in 1996, camera crews caught whales breaching the ocean water in the background, which helped bring attention to the majestic scenery of Cabo. 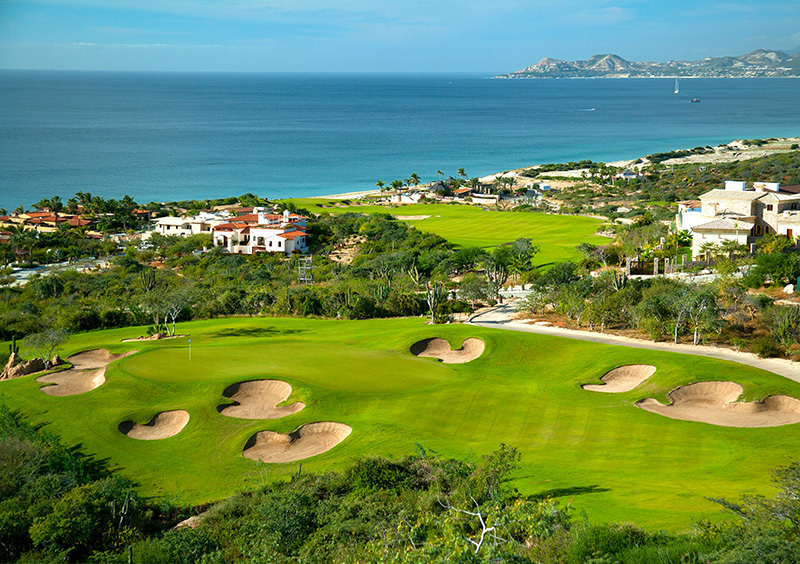 At Cabo Real, the first nine is somewhat light in comparison to the more demanding back nine. On the more difficult holes, be sure you have all your tools available to play your best game. And if you're golfing with someone else here are some gift ideas to help them out. All of the courses reviewed so far are open to the public. Quivira, however, is exclusive to residents and guests of the Pueblo Bonito Resorts and Spas. This course has some of the most truly stunning scenery you'll find anywhere. It’s famous for its spectacular views. Some holes are placed on cliffs overlooking the stunning Pacific Ocean. Other holes weave through unique rock walls and sand ridges. Reserved for guests of the Diamante Resort and club members, the Dunes Course combines holes fitted between massive sand dunes with beautiful coastal views. The 12th holes is a stunning par 5, located oceanside. It becomes a memorable course for finishing on a fairly challenging par 5 as well. During your stay at Diamante you'll also want to take advantage of their other exclusive course, El Cardonal. Featured in places like ESPN, this course is the first designed by Tiger Woods. Use this list to start exploring the best golf courses in Cabo. Whether you book your stay for a weekend or the full week, make sure you get the most out of it. Try Golf Pad TAGS to automatically track your stats and improve your golf game. With tags linked to your phone, you can easily track your score, distances, accuracy, and more.